While there’s no denying that a newly installed roof can be a thing of beauty, oftentimes it doesn’t stay that way long. Prone to rot, insect infiltration, and algae growth, there are a plethora of reasons that the vast majority of homeowners are in favor of lower maintenance roofing options, such as asphalt and metal. Michael’s property in the Old White Bear community has a stunning lake view. His primary reason for reaching out to our company was because his guest home had a cedar shake roof in desperate need of replacement. The wood had become weathered and many of the shakes had algae growing on them. The guest house was surrounded by mature trees which were continuously shedding twigs and pine needles onto the roof. 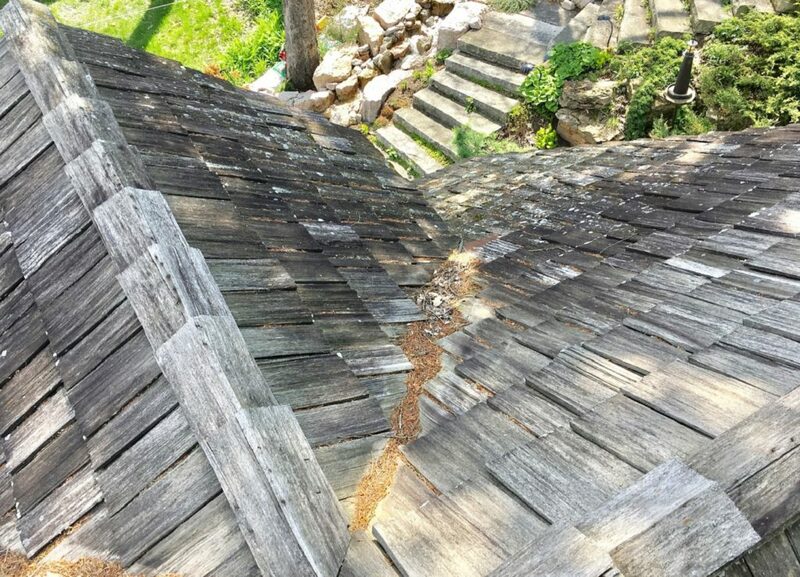 On average, a well-maintained cedar shake roof has a lifespan ranging from seven to fifteen years and requires frequent cleaning in order to maintain appearances. After discussing the pros and cons of popular roofing materials, Michael ultimately chose Englert metal roofing. Fire Rating: Englert metal roofing carries a Class A fire performance rating, which is classified as the greatest resistance. Cedar shakes present a fire hazard and some states no longer allow them to be installed because of this. Durability: Englert metal roofing has a 50-year warranty on the steel and the finish has a 35-year warranty. 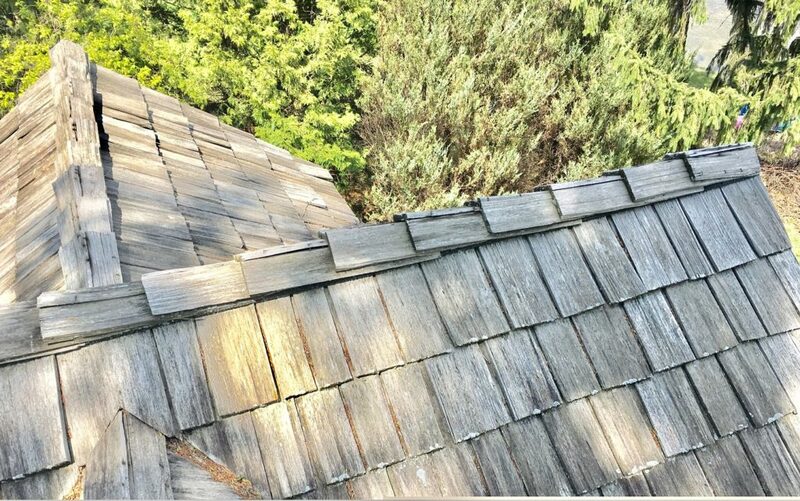 Cedar shake roofs simply can’t touch these types of warranties. Here’s how the roof turned out! Green Attributes: Cedar is a slow-growing tree that can take 200+ years to be mature enough to be harvested for cedar shakes. 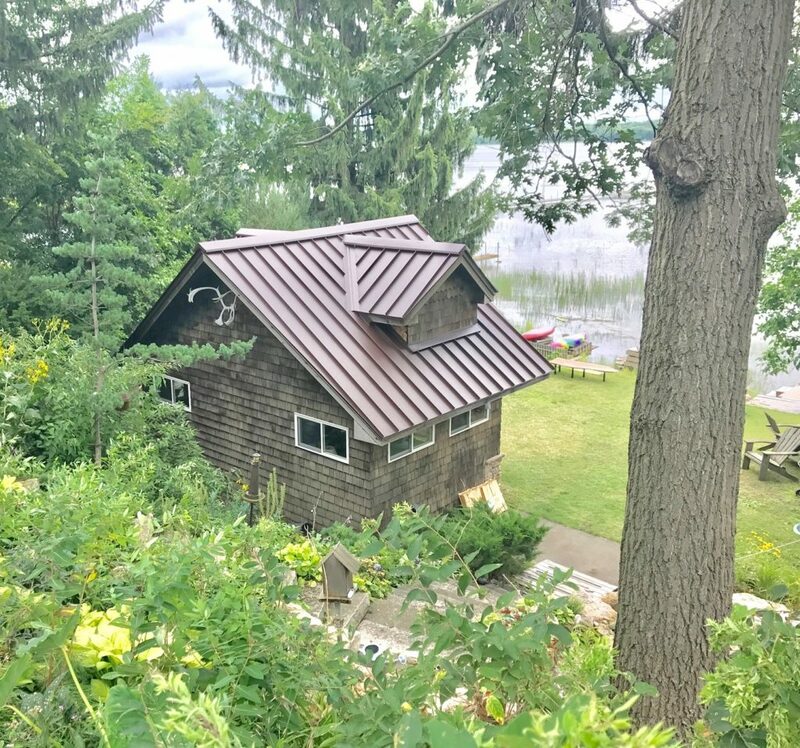 Metal roofing is comprised of 100% recyclable material. In addition, the finish used on Englert metal roofing has a high reflectivity and low emissivity. This equates to summer cooling costs that can be lowered by 20-40%. Maintenance: With a metal roof, there’s no concern of ice dams, algae growth, or organic debris sitting on it and damaging the roof. These concerns are abundant with a cedar shake roof. Cedar shakes were proving to be problematic on this Northern Wisconsin roof. Read how we helped the homeowner address the situation. These St. Paul homeowners opted to replace their asphalt roof with a metal one. Get the details here! Following his death, Noel’s wife, Karin, reached out to us to share what a positive impact the completion of the project had on Noel’s final days. "Great work and a very professional installation crew. So glad to have our new gutters." - Robert P.
"Had Lindus re-shingle our roof this summer following a hail storm and while I don't know much about roofing I do know a lot about customer service and they were excellent. Easy to trust a company that is honest and dedicated to their work. I have also referred them to two neighbors who have also used them with equally satisfying results." - Howard J. "The crew showed up on time. They answered all my questions and made great suggestions about the installation. It turned out better than I ever expected." - Carey M.
"I have been happy with my LeafGuard® gutters." - Terry H.
"Excellent, from start to finish everything was perfect." - Marsha F.